Behind every cycling game there is a story and a lot of work. Here are five (so far) examples. The game my producer made is not what I had in mind, but it was better to have the game produced, than having nothing at all. 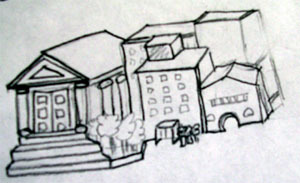 First of all, I had to redesign it all, due to the box and board format. The route could only have some curves if it wasn't very large. 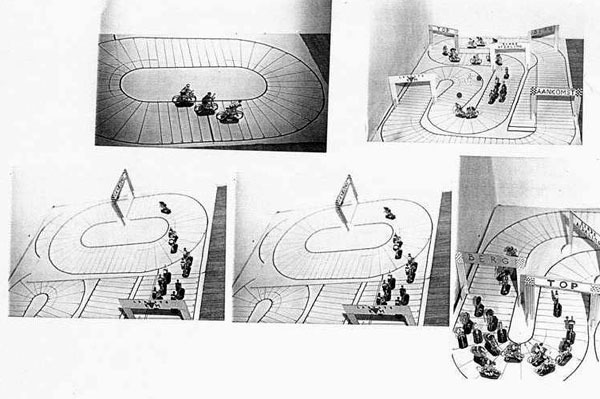 My original game was with the big 1/32 scale riders, and you could put 6 riders side by side, so you can imagine how big that board is. 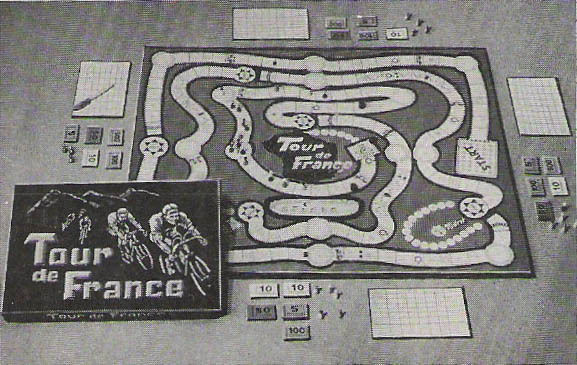 The original idea comes from my father, who did play it as a young boy (30's-40's) using pictures of the cyclists. 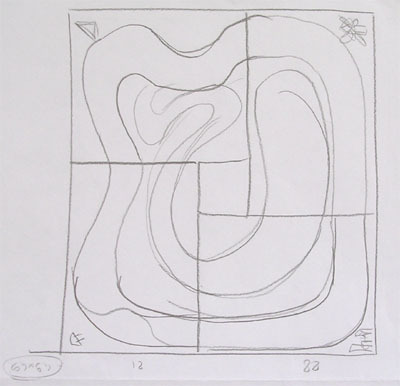 It's very simple, flat route 2 dice, climbing 1 die, descending and sprint 3 dice, no tactics. 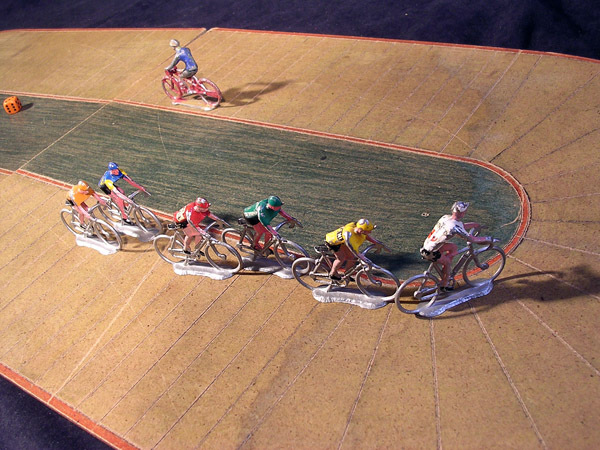 In my youth the 60's and early 70's, we played it with the 1/32 scale cyclist figures. 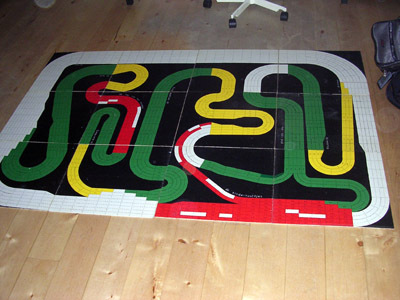 In the 80's, I did want to make the game look more like a real race. The taking the wheel is an obvious introduction. Diferences between rider types also. Brick road to do the classics. To give riders the possibility to attack, extra dice throwing of course. But here comes the difference with the game publiced. In my game every rider receives a number of extra dice throws(more for the team leader), but to attack, a rider must use 2 extra dicesa once (not while climbing, then only a climber can use 1 extra dice, limited to 1 per mountain.) A rider can use 1 extra dice to accelarate, giving the possibility to the rider who follows, to stay in the wheel, not whit an attack. Also riders can trade plces while beeing in the wheel (and in hte same route type). Your rider does not have to use al the points thrown. Now, you have a race: helpers are used to bring your team leader, climber or sprinter in a good postion, they even can wait for him, if he didn't pas wellthe start, a mountain or brick road. If your favorite rider has still some extra dice throws left in the final boad, he can make the ultimate attack, or jump to the wright wheel. Riders who escaped can alternate to use extra dice throws to stay in the lead. Those who missed the escape have to organise the persute, or decied to make the jump. But you can't win without organising the team. 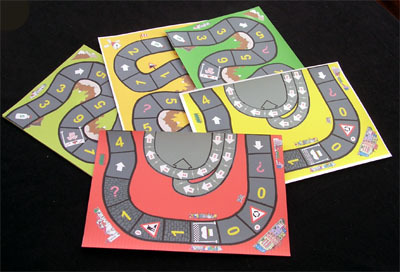 Now you have the ultimate cycling game, simple but you need to think a lot about tactics. Dear reader, you can not begin to understand how proud I am to find the game that my father developed way back when I was a boy. The name of my father is John Hommes, he was the son of my grandfather who founded the Homas factory. 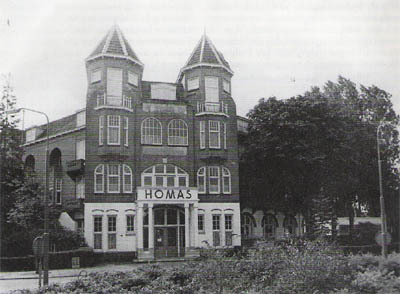 Homas stands for Hommes (our familyname) and Assen (our hometown). I can easily recognize his design in the graphics since I have watched him drawing and sketching for decades. He passed away in 1999, the firm went broke around 1980. Got to show this to my mum who is turning 80 this year. Greetings, Harry Hommes, Assen, Holland. 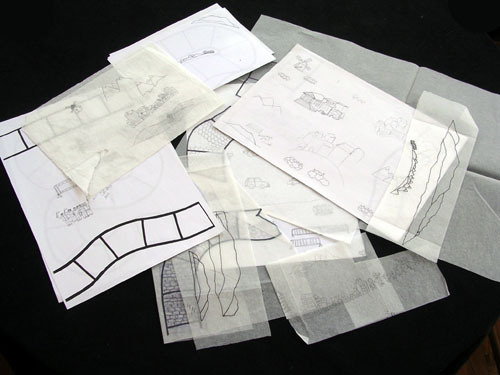 A small history about the family background concerning the factory. 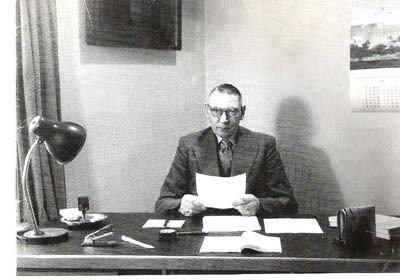 It was founded by my grandfather Hendrikus Hommes (1894-1973) in 1923 in his hometown Assen, situated in the north of Holland. 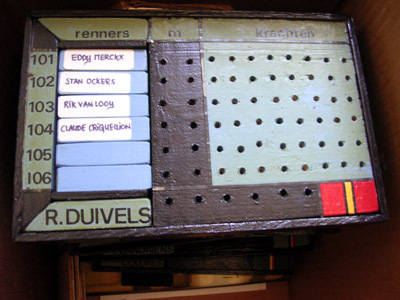 In those early years they manufactured "sjoelbakken" (a typical Dutch familygame, a kind of wooden shuffleboard) and meter-sticks that people could use to measure fabric. Another polular game in those days were the yo-yo's. During the war there was a shortage of wood and because of that my grandfather switched to repairing wooden shoes. After the war the factory bloomed: brochures from the fifties and sixties showed an extensive array of games like puzzles, chess-sets, billiards, table tennis, bowling sets and other (board) games. Some were imported, some were self invented like the Homas-tour.My father, John Hommes (1926-1999) worked almost his entire life in his fathers company. 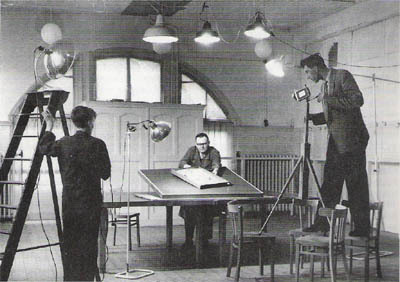 During summerholidays it was an ideal place for me to earn some cash. In 1983 is was "game over", the company went broke, families stopped playing games together and electronic games stepped in. By the way, according to Harry Hommes there is a small secret mystery hidden in the game, in the face of the first cyclist portrayed in the box. See the box, concentrate on the face of the cyclist up front and tell me if there is anything that strikes you as odd.....please do and let me know. There is a small secret there. 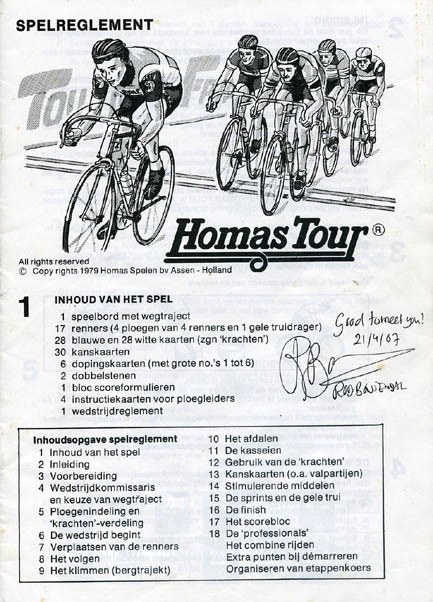 Some years later Homas released another cycling game, designed by Rob Bontenbal, HOMAS TOUR (later released as "Um Reifenbreite" by Jumbo), which happens to the best-selling cycling game ever. I had the pleasure of meeting Rob, who showed me some early designs of the game. This is not Bob's first design, but it is the one he used to play with for a long time. The board is HUGE (160 x 120 cm, on 12 40 x 40 cms wooden panels), as you can see by the chair on the background. Here are some of the teams he used. This is the translation of Ludo's account. The Dutch original is on his website. 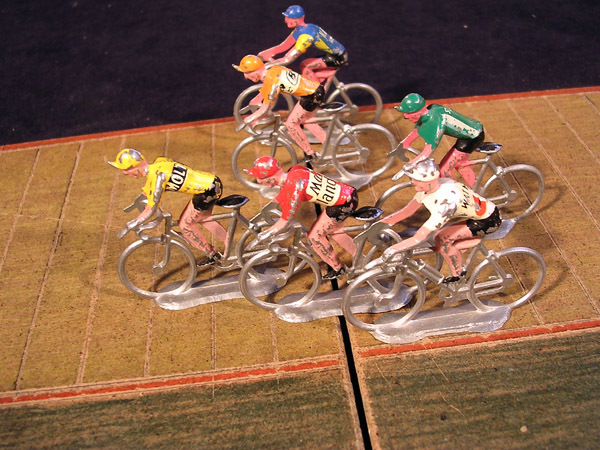 I think I was about 12 when I got a box of plastic cyclist figures. Cycling was part of the family since my father was also is entire life in cycling and we followed the actions of our heroes live and on TV . 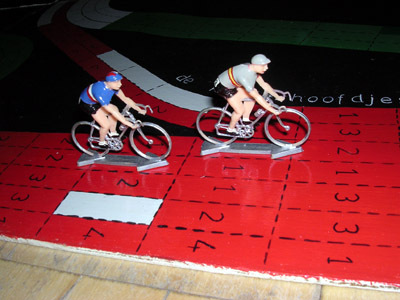 While playing with the miniature cyclist I made all the famous stages and classics all over again. I made tracks of playing cards and beer-spills. The beer-spills were the broad, flat asphalt sections. 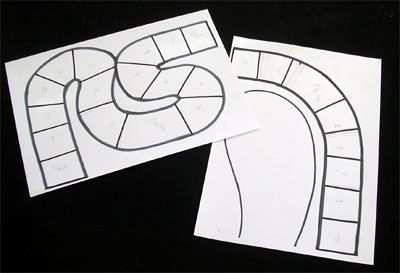 The playing cards were either small coblestone sections or uphills. Using the card and spills in different ways I built always other races. 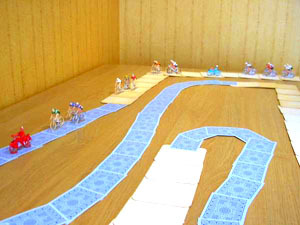 On the beer-spills there was space for 5 cyclist next to each other, on the playing cards there was only room foor 3. 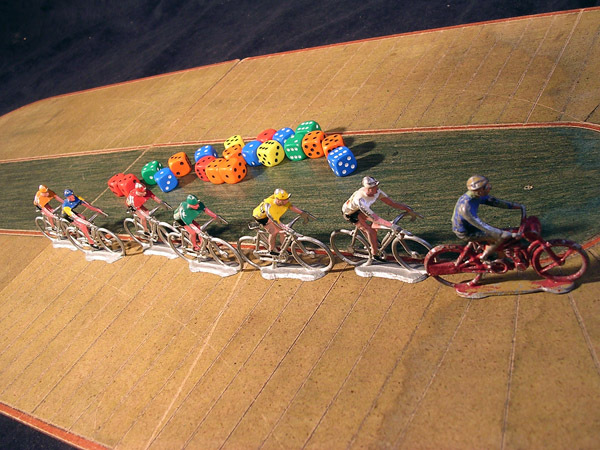 The order to roll the dice was the order of the cyclists in the race. Cyclists couldn�t jump over each other, so when on a narrow section 3 riders were next to eachother, no other could pass. On the flat sections cyclist could roll a 3,4 5 or 6 (when rolling a 1 or 2, there was a re-roll). On the uphill sections the value of the dice was divided by 2. So cyclist could only move 1, 2 or 3. When there were coblestone sections in the race, I had a system to simulate punctures. I used a small casino roulette. 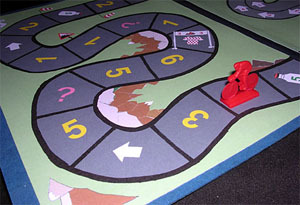 Before starting a new turn (rolling the dice for the first cyclist), I rolled the roulette and the figure where the ball stopped was the position of the cyclist who would have a puncture (not every turn there was a puncture because the cyclist who was marked by the roulette had to be on a coblestone section). When the cyclist had a puncture, there was again a roll of the dice to derteminate how many turns it should take to get another wheel. Here the value of the dice was again divided by 2. 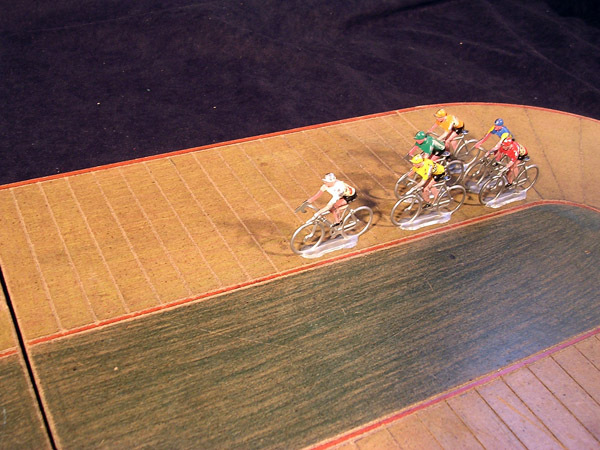 A cyclist who had moved was aligned to the right of the track, when there were cyclists next to each other on the same track-section, the leftmost went first. In intermediate sprints and at the finish there were points to gain for the green jersey and also bonus seconds for the yellow jersey. On the hills there were points for the mountain-classification. 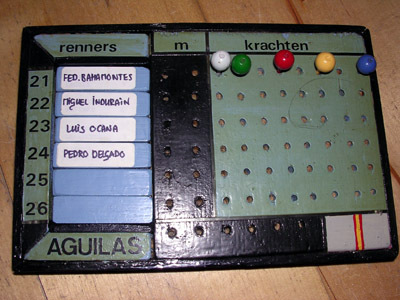 At the finish there was a system to make a classification in time. For every gap behind the finish line there was a time delay counted (5 seconds for every track section). So when there was a gap of 3 track sections between 2 cyclists there was a gap of 15 seconds. All cyclists that arrived whitout a gap between them got the same time. The time-counting at the finish with intervals of 5 seconds, combined with the bonus seconds at the intermediate sprints and at the finish made up really realistic time classification. 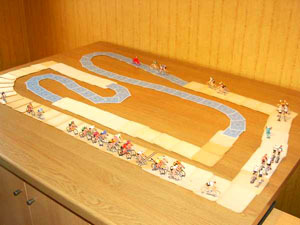 Some years ago I was lucky enough to purchase an old hand made track along with some Salza riders and a Derny (By the way, it got lost by Italian mail, and I must thank my friend Donato Pompei for helping me to recover it). Not knowing what to do with it, I tried a fef rules I had in mind for a solo game. You needed a lot of dice though, one for the first rider, two for the second... and six for the sixth rider. 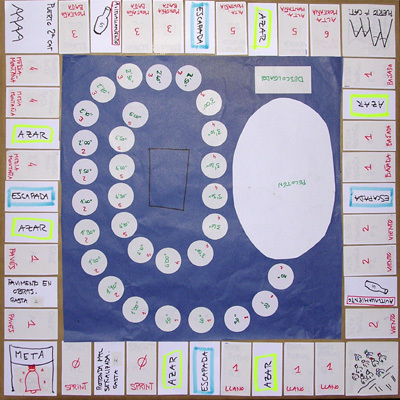 I published the game on the site and I listed it as a free print'n'play game, but there was nothing to print ( except maybe the rules). I wrote: "You will need a track. 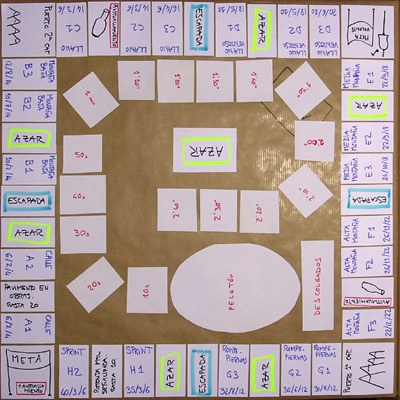 You can use any that belongs to another game or make it one using the templates in the make your own game section. 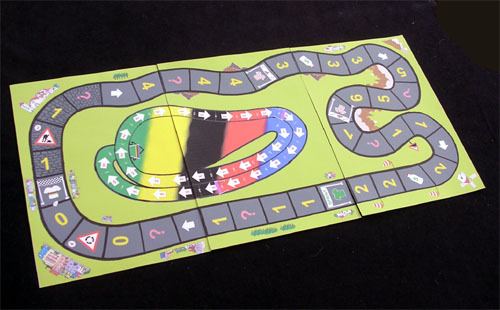 You will also need six riders in different colours (some available also in the "make your own game" section) and 21 dice in six different colours, so that one dice matches the colour of the first rider, two match the colour of the second rider, and so on, until the sixth rider, for which you will need six dice. I hope you have that many dice at home. I do. It is nice (but not necessary) than the cyclists are bigger than the fields on the track. I like it when the riders occupy three fields each. That is just because the riders start in every third field, and in that way they are in a line. As I said, this is not necessary for the game. Equally, it is nice to have a derny figurine, but just for the ambiance." We had to start all over again! Not to mention the hard time we had until we found the right boxes to fit the game in. Finally the boxes were made to measure by Pere Masmitj� (thanks! ), who was suggested by Pau (thanks, too). Pau has one of the finest wine stores in Barcelona (Verema i Collita). So the moral of this story could be: drink good wine and you will make good games!